[Lat.,=something holy], an outward sign of something sacred. In Christianity, a sacrament is commonly defined as having been instituted by Jesus and consisting of a visible sign of invisible grace. Christianity is divided as to the number and operation of sacraments. [Gr. leitourgia = public duty or worship] form of public worship, particularly the form of rite or services prescribed by the various Christian churches. religious service of the Roman Catholic Church, which has as its central act the performance of the sacrament of the Eucharist. It is based on the ancient Latin liturgy of the city of Rome, now used in most, but not all, Roman Catholic churches. The term Mass [Lat. [Lat.,=sacrificial victim], in Roman Catholic practice, consecrated wafer of the Eucharist. The bread used is pure white and unleavened, baked in small disks. The Hosts not consumed at Mass are set aside especially for the viaticum, for the sick, and for adoration, as at benediction. [Lat.,=body of Christ], feast of the Western Church, observed on the Thursday after Trinity Sunday (or on the following Sunday). The feast, which celebrates the founding of the sacrament of the Eucharist, was established generally in 1264 with an office by St.
A Bishop raises the Eucharist, the embodiment of Christ in Catholicism, as part of the sacrament of Holy Communion. AP/Wide World Photos. Then came the day of Unleavened Bread, called the Passover. Jesus sent Peter and John, saying, "Go and make preparations for us to eat the Passover." ... When the hour came, Jesus and his apostles reclined at the table. And he said to them, "I have eagerly desired to eat this Passover with you before I suffer." ... And he took bread, gave thanks and broke it, and gave it to them, saying, "This is my body, broken for you." ... In the same way... he took the cup and said, "this is the cup of the new testament... this is my blood, shed for you... do this in remembrance of me" (Luke 22:7-21). Whether it's called Eucharist, Communion, the Lord's Supper, or the Last Supper, this meal is the central ritual binding together all Christian churches. Every denomination considers it a sacrament, a "sacred mystery," and considers it central to the understanding of what it means to be a Christian. It is one of the two sacraments all Christians celebrate in common, the other being baptism. Of course disagreements abound as to what Jesus meant, how to serve the meal, who can serve and partake, and what mystery occurs during its celebration. But this meal is the most universal and significant symbol in all of Christendom. We begin with a question. What happened at the first Communion meal? There is no question but that it came at the end of a Seder feast (see Passover). Luke makes it clear the disciples had met to celebrate a traditional Passover meal together. Not only were Jesus' instructions specific to that end, but the disciples were reclining around the table, typical even at contemporary Seder feasts, and it would have been perfectly normal for them to meet in this way at this time. They would typically have been remembering back over the last 1,500 years to the first Passover meal, eaten in haste by their ancestors in Egypt on the night before the Exodus. To them, this would have been a memorial feast, and Jews all over Jerusalem—indeed, all over the world— would have been meeting this night in similar fashion. But this raises an interesting question. Passover instructions are quite explicit that the Seder is to be a family event. The whole purpose of the meal is to gather the family together to tell the old, old story. So where were the women? Mary, Jesus' mother, was in town the next day at the crucifixion. Where was she this night? It would have been unheard of, an absolutely disgraceful action, for a Jewish man to celebrate this meal without his mother present if she were anywhere nearby. The Passover ritual requires specific roles for women, men, and children who participate together. Granted, situations sometimes arise when exceptions have to be made. But who prepared the meal? The apostles Peter and John? Given the culture of that day, it is a decidedly improbable thesis. But the Bible mentions no women present at all. Could the famous Leonardo Da Vinci, who pictured all thirteen men sitting on one side of a long table, the better to see everyone's face, have misled entire generations? We are simply left to theorize. Perhaps Jesus wanted to be alone with the men who were closest to him. Maybe, even though it appears obvious, it wasn't a Passover Seder at all. Or maybe the women were there after all, but the Bible just doesn't mention them. Perhaps they were out in the kitchen by this time. There are other mysteries surrounding this event. They seemed to drink a lot of wine that night. According to Luke, everyone seems to have had at least three portions, and there were probably many more served. Is it a coincidence that a few hours later they were all having trouble staying awake on the most important night of Jesus' life? In the immortal words of the rock opera Jesus Christ, Superstar, "What's that in the bread? It's gone to my head!" Were the disciples drunk? And so the speculations continue. It is not even known what day of the week the Passover was celebrated that year. Tradition says it happened on a Thursday evening. But this raises serious chronological problems. If Jesus was arrested Thursday night and crucified Friday, how do we account for three days and nights in the tomb before Sunday morning, as Jesus prophesied (Matthew 12:40)? But if the meal took place earlier in the week we encounter more problems. The day after the crucifixion was a Sabbath. The story says specifically that Jesus had to be taken down from the cross before sundown just for this reason. So he must have been crucified on a Friday, unless the Sabbath referred to was the Passover itself. If the crucifixion took place on Wednesday and the Passover on Thursday, they would have had Friday to bury him before the regular Saturday Sabbath and an extra two days can be added to the scenario. But that can't be, first because the women who wanted to prepare his body for burial would have done so on Friday, with no reason to visit the tomb on Sunday morning (see Christ/Jesus of Nazareth), and second because Jesus' instructions specifically mentioned the Passover meal. No single explanation has ever been offered that fits all the chronologies. We are left with the fact that we don't know when the meal took place, although Christians celebrate it on a Thursday. We don't know who attended, we do know they reclined at the table, but we picture them sitting up straight in modern chairs. The events mark only the beginning of the problem. Significant debate arises when Christians try to decide what the whole thing means. There are four different interpretations held by the various Christian traditions. This is the interpretation held by the Roman Catholic Church ever since the sixteenth-century Council of Trent. The council determined that Christ "is truly, really and substantially contained in the sacrament under the appearance of sensible things.... By the consequence of the bread and wine a change is brought about of the whole substance of the wine into the body of his blood. This change is called... transubstantiation." 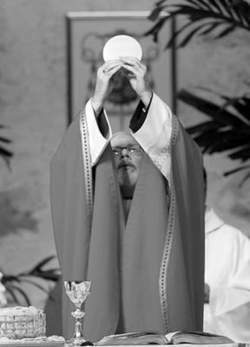 In this view, when the priest holds up the consecrated host and intones the words of the Mass, the wine and bread, although they appear unchanged, undergo a mystical process that actually transforms them into the very body and blood of the Christ. During the Middle Ages, it became the custom for an altar boy to hold a plate or some such thing under the chin of the person receiving the host to prevent the body and blood of the Christ from accidentally falling on the floor where it might become lunch for a passing mouse. It cannot be emphasized enough that the Roman Catholic Church revolves around the Eucharist. At the Second Vatican Ecumenical Council, the opinion was set down that "Truly partaking of the body of the Lord in the breaking of the Eucharistic bread, we are taken up into communion with Him and with one another.... No Christian community... can be built up unless it has its basis and center in the celebration of the... Eucharist." Although the term doesn't appear in any of his writings, consubstantiation was the view of Martin Luther and remains the official position of the Lutheran Church today. Luther believed Christ is present "under or with (con) the species of bread and wine." In this view a union takes place between the heavenly and the earthly, even though the bread and wine are not changed in substance. Instead, they are infused with the reality of the divine. In this view, held by many mainstream Protestant churches, the bread remains bread and the wine (many substitute grape juice) remains wine. But Christ, always present with the believer, is somehow represented in a way that is similar to, but at the same time different from, normal life activity. The "real presence" of Jesus is there when "two or more" believers gather together to break bread "in his name." In this view, held by many non-liturgical traditions, such as the many Baptist denominations, when Jesus said, "do this in remembrance of me," that's exactly what he meant. The communion meal is a memorial to what Jesus did on the cross. The bread and grape juice are symbols of his body and blood. They remind believers of Jesus, but nothing changes in terms of substance. Jesus is no more or no less with the believer than he always is. Despite the differences in theological interpretation of the Eucharist, some consider the commonality of the ritual to be a miracle in itself. Christians cannot agree about the chronology or participation in the first ritual. They cannot agree as to what it means. In some cases they don't even allow Christians of different persuasions to come to their altars and receive the sacred elements. Like the caste system of ancient India, the higher you are on the theological ladder of Eucharistic social order, the less you tend to allow those of lesser purity to partake with you. But the miracle is that the communion service still is one that all Christians hold in common, and one ritual that allows believers to cling to their concept of "one, universal and apostolic church." Three of the four Gospel accounts of Jesus' death state that on the night before he died he shared a ceremonial meal with his followers. Christians call this meal the Last Supper and honor it with religious observances that take place on Maundy Thursday. This meal is also commemorated each Sunday in churches throughout the world in a ceremony called the Eucharist. The Eucharist serves as the central and most important ritual in Christian communal worship. As this ceremony recalls the events surrounding Jesus' death and resurrection, it may be thought of as an Easter symbol and custom which millions of Christians participate in every Sunday. Jesus himself founded the ceremony of the Eucharist at the Last Supper (for more on the Last Supper, see Maundy Thursday). Christian scripture asserts that at this meal Jesus gave thanks to God for bread and wine, identified them as his body and blood, and passed them to his disciples to eat and drink (Matthew 26:26-29, Mark 14:22-25, Luke 22:16-19). These words and actions form the basis of the contemporary celebration of the Eucharist. A closer examination of their historical and cultural context illuminates their significance to Jesus'followers and to the first Christians. The Gospels of Mark, Matthew, and Luke assert that the Last Supper was a Passover meal. (The Gospel according to John implies that the Passover supper would take place on the evening of the following day.) The yearly Passover festival originated in biblical times as a means for Jews to express their gratitude to God for leading their ancestors out of slavery in Egypt over a thousand years before Christ was born (see also Salvation). Through participation in the religious ceremonies associated with Passover, Jews also reaffirmed their relationship with God. The Book of Exodus tells that the Jews enslaved in Egypt sacrificed a lamb to God and smeared its blood over their doorways as a sign of their faithfulness to the Lord. Afterwards they consumed the sanctified flesh of the lamb, waiting in readiness for God to deliver them. In Jesus' time religious custom required those celebrating Passover to make a pilgrimage to Jerusalem. Once there they brought a lamb to the Temple, where the animal was killed as an offering to God. The sacrificial lamb recalled the original offering their ancestors made while slaves in Egypt. In Jesus' day worshipers took the lamb home after it had been offered to God by the Temple priests. Then it was roasted and eaten by a gathering of family and friends. This ceremonial meal also included unleavened bread and wine. Scriptural accounts of the Last Supper describe a meal that resembles a traditional Passover supper in some ways and diverges from Jewish custom in others. As in a traditional Jewish Passover meal, Jesus gave thanks to God for the bread and wine before passing them to his disciples. But in a sharp break from Jewish religious teaching he proclaimed that the bread was his body and the wine his blood. In Matthew's account Jesus adds that his blood is "my blood of the covenant, which is poured out for many for the forgiveness of sins" (Matthew 26:28). Here Jesus is painting himself as a new kind of sacrificial lamb, one whose death will rescue his followers from the consequences of sin, and pave the way to a new relationship with God. The first Christians quickly interpreted Jesus' words and deeds at the Last Supper in terms of the Passover themes of sacrifice, redemption, and salvation. Jesus' death on the cross on Good Friday became the sacrifice which reunited a straying humanity with God. By accepting Jesus' body and blood as represented in bread and wine at the Last Supper, Jesus' original followers accepted both his act of sacrifice and the spiritual renewal that sprang from it. The early Christians developed a ceremony called the Eucharist in order that Jesus' growing numbers of followers could also share in this new relationship with God and one another through Christ. Just as religious Jews consumed the flesh of the Passover lamb, the new ceremony required Christians to consume the body and blood of the Savior who had died for their sakes. The body and blood were represented, as they had been at the Last Supper, by bread and wine. The word "Eucharist" is an English pronunciation of the ancient Greek word eucharistia, which means "thanksgiving" or "gratitude." This name, given to the ceremony by the early Christians, reflects their attitude towards it. The ceremony and the prayers that accompanied it expressed their gratitude to Christ for rescuing them from sin, opening the door to a new relationship with the Divine, and promising them eternal life. At first, groups of Christians shared bread and wine together informally, as part of an everyday meal. As time went by this sharing of bread and wine grew increasingly ceremonial. By the fourth century Christians were celebrating the Eucharist in public buildings under the supervision of robed clergy, accompanied by Bible readings, prayers, chants, homilies, and the prayer of thanksgiving, which retold Jesus'words and deeds at the Last Supper. Over the centuries many controversies have erupted over differing interpretations of the Eucharist. One of the most significant debates took place during the sixteenth-century western European Reformation. This period of religious strife gave birth to Protestant Christianity. Among other things, Protestants disagreed with the Roman Catholic doctrine concerning the Eucharist. This doctrine states that although neither the bread nor the wine of the Eucharist seems to change in appearance, they change in actual substance, becoming the real body and blood of Christ. Roman Catholic theologians explained the mechanics of this transformation in a doctrine known as transubstantiation. Protestant reformers disagreed with the idea that the bread and wine change into the actual body and blood of Christ. Today's many Protestant denominations attribute varying shades of meaning to the ceremony, but most tend to view the bread and wine as symbols that represent the body and blood of the Savior. They would also affirm, however, that Christ, through the power of the Holy Spirit, is indeed present with those who participate in the ceremony. Other differences distinguish Protestant and Roman Catholic views of the Eucharist. Whereas Roman Catholic theology views the ceremony as an invitation to worshipers to partake of Jesus'sacrifice, many Protestant theologians instead see it as a memorial, or reminder, of Jesus' sacrifice. The Orthodox Christians of eastern Europe, the Middle East, and north Africa offer yet another perspective on the ceremony. Like Roman Catholics they tend to view the ceremony as Jesus' renewed offering of himself to the assembled worshipers. They also agree that worshipers partake of the actual body and blood of Christ. Yet unlike Roman Catholic theologians, Orthodox theologians offer no definite explanation for how this miracle takes place. Instead they view Christ's presence in the bread and wine of the Eucharist as a mystery. By "mystery" they mean one of the hidden and unfathomable ways that God works in the world, sometimes perceived by those who look through the eyes of faith. Therefore the best way to "understand" the Eucharist is to participate in it with reverence, prayer, and meditation. In sum, Orthodox Christian authorities approach the ceremony as a spiritual experience to be savored rather than an intellectual problem to be solved. Today many different versions of the ceremony exist. Nevertheless, the heart of the ritual consists of the identification of bread and wine as Jesus' body and blood and the invitation to worshipers to partake of them. In doing so Christians remember Jesus' sacrificial death and resurrection and commit themselves again to the new covenant, or relationship with God, that these events brought about. They ask to draw nearer to God through Christ, and accept the spiritual healing, or salvation, that comes from this relationship. Participation in the ceremony helps to create a feeling of fellowship between worshipers as they together share in God's hospitality, expressed in spiritual food and drink. At some contemporary Protestant services grape juice substitutes for wine (for more on this issue, see also Wine). In many churches, including those of the Roman Catholic, Orthodox, and Anglican traditions, the Eucharist stands at the heart of the Sunday worship service. Protestants, in general, celebrate the Eucharist less frequently. In some denominations the ceremony is known as the Eucharist, while in others it may be called the Lord's Supper or Holy Communion. Various Christian denominations have assigned different names to the worship service centered around the celebration of the Eucharist. Roman Catholics and some Anglicans call it a "Mass" and Orthodox Christians know it as the "Divine Liturgy." Protestants refer to the service by a variety of names, including the Eucharist, the Lord's Supper, or Holy Communion. Ferguson, Everett, ed. "Eucharist." In his Encyclopedia of Early Christianity. Volume 1. New York: Garland, 1997. Hellwig, Monica K. "Eucharist." In Mircea Eliade, ed. The Encyclopedia of Religion. Volume 5. New York: Macmillan, 1987. "Hospitality." In Leland Ryken, James C. Wilhoit, and Tremper Longman III, eds. Dictionary of Biblical Imagery. Downers Grove, IL: InterVarsity Press, 1998. McNicol, Allan J. "Lord's Supper." In David Noel Freedman, ed. Eerdmans Dictionary of the Bible. Grand Rapids, MI: William B. Eerdmans Publishing, 2000. Peifer, C. J. "Passover Lamb" and "Passover Meal." In New Catholic Ency- clopedia. Volume 10. New York: McGraw-Hill, 1967. "Redemption." In Leland Ryken, James C. Wilhoit, and Tremper Longman III, eds. Dictionary of Biblical Imagery. Downers Grove, IL: InterVarsity Press, 1998. Reumann, John. The Supper of the Lord. Philadelphia, PA: Fortress Press, 1985. "Supper." In Leland Ryken, James C. Wilhoit, and Tremper Longman III, eds. Dictionary of Biblical Imagery. Downers Grove, IL: InterVarsity Press, 1998. Williams, Sam K. "The Lord's Supper." In Paul J. Achtemeier, ed. The Harper- Collins Bible Dictionary. New York: HarperCollins, 1996. 24-25), it is fitting to consider anew the lives of the saints who stood out for their devotion to the Most Holy Sacrament of the Altar. David Aers, in 'The Sacrament of the Altar in Piers Plowman and the Late Medieval Church in England', explores Langland's understanding of sacraments, especially the sacrament of the altar, and provides a useful counterbalance to the other sacraments that have received critical attention in Langland scholarship. Thomson suggests (161) that Joan Baker's 1511 statement that she knew the sacrament of the altar better than the priest did may indicate the existence of alternative Lollard services.